As one of the world’s best known and award-winning advertising agencies, Leo Burnett knows a thing or two about getting a message out to people, but the company recently discovered that many of its internal messages – the latest work with commercials, many events, client wins and other news and opportunities – were not getting through to its employees. A complication was the sheer size of the headquarters office, which occupies 16 floors in the Leo Burnett Building at 35 West Wacker Drive in Chicago. Since everyone on a given client team works on the same floor, employees have little reason to visit other floors, which means they tended to see only work produced on that floor. There were a lot of people who needed to get the messages, but a real challenge for management to get it to them. Tyler Anastasia, vice-president, internal communications at Burnett, was inspired by the dynamic video displays at several hotels and resorts. He realized that a multiple-screen video display system would be an ideal forum for presenting all manner of information to agency personnel. The energy and action of video displays would capture attention. Whatever was chosen also had to be very easy to use and self-sustaining, while the digital content management system had to make everything look like it was from Burnett, including the branding and colours. Leo Burnett’s management teamed up with Four Winds Interactive, Denver, to use digital signage as a way to keep everyone up-to-date. FWi was chosen due to its reputation for innovative thinking, the simplicity of its software and for the fact that it has created a number of systems that sparked Anastasia’s imagination. Both software and implementation of the system was by FWi. The company and Leo Burnett worked to install 21 horizontal video screens in public areas so employees and visitors alike could be informed of everything from the latest client news and stock prices to internal company news. Six screens reside in the main reception area on the 21st floor, where their job is to impress and immerse visitors in Burnett’s award-winning work and culture. 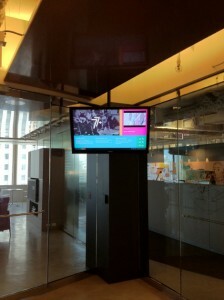 Each of the other 15 floors also has a screen near the elevator banks – the most important common area on those floors. One screen is in Anastasia’s office so he can keep up with how the ‘Burnettwork’ network continues to evolve. With multiple displays on each of the floors of the corporate offices, the signage is constantly rotating information so everyone within the company can be informed in an attractive, state-of-the-art, and interesting way. 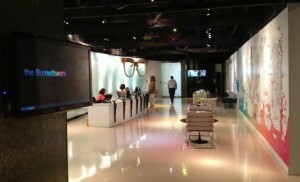 Structurally, the entire Burnett work is hosted on a single server located in the reception area that acts as the content store. That server can be accessed from anywhere in the building, including on the wireless network. Hackett can even add content or make changes from home. Content can then be pushed out to individual screens, a targeted group of screens or all screens at once. One item that was important to the executive team was to display the current stock prices for Burnett’s clients. The company’s web development team and FWi worked together to allow those prices to stream in to the news ticker between news feeds. We’ve learned that Burnett is now considering creating an app so it’s available on smartphones, and expanding the network beyond the Chicago office. Leo Burnett has seven or eight brands that together have offices all over the world. Currently all of the brands and offices contribute to the Burnettwork; ideally that work will be shared with every other office in the company. That program likely will be piloted by the Leo Burnett New York and Detroit offices. If successful, they hope to expand it throughout the agency’s brands on a rolling basis – a capability the FWi solution makes possible. In the meantime, Leo Burnett management says the current project has been a hit. “Some people have told us they miss their elevators because they get so caught up in watching the screens,” says Hackett. 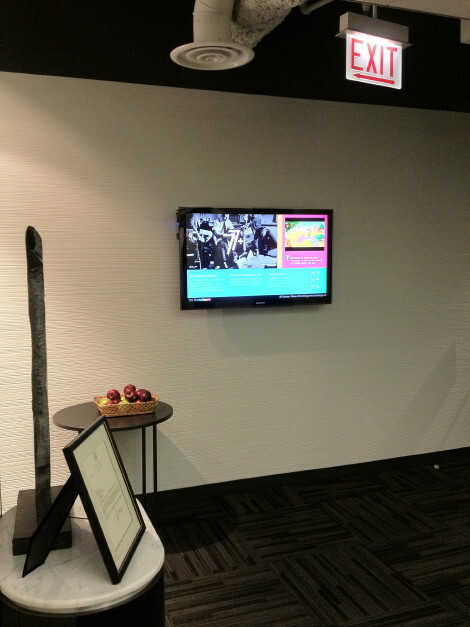 This entry was posted on Tuesday, July 31st, 2012 at 17:00 @750 and is filed under DailyDOOH Update. You can follow any responses to this entry through the RSS 2.0 feed. You can leave a response, or trackback from your own site.